I'm back with the first post of The Siblings Project for 2018. I'm hoping I remember to take a photo each month, so by the end of the year I will have 12 photos of my girls to look back on! I have absolutely loved watching the girls' relationship develop over the past three months. They both adore each other already. As soon as Sophie wakes up in the morning or gets in from school, she will ask where Amelia is and go and pay her some attention. 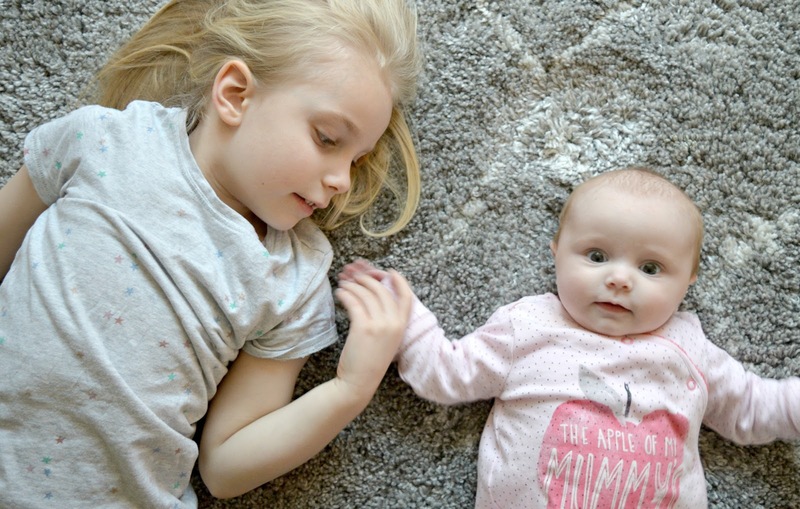 Amelia absolutely loves her big sister and gives her the biggest smiles when she sets her eyes on her. She babbles and coos away to her, which is just so adorable! Sophie is still being very helpful and will pass me things to change her nappy, whether it be a nappy or a change of clothes. She just likes to help, which is a bonus of the 4 year age gap! She also loves to help bath her, so I think I will let them bath together more often, as I'm sure they would both love that. I can easily put Amelia's Shnuggle bath in the big bath and they can play together then. I can't wait to see how their relationship grows over the next few months and years and to be able document everything.